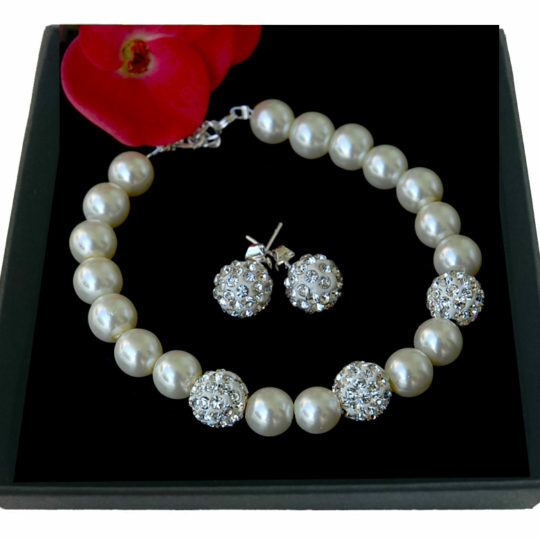 A set consisting of a bracelet and earrings made of white glass pearls and crystals in diamond shape. Pearls are classic and timeless beauty! MATERIALS: Glass pearls in white with a diameter 6mm, tiny glass beads. This set is finished with silver-plated elements. MEASUREMENTS: Length of the bracelet – 16,5cm plus 4cm of extender chain, Earrings – 6cm without earwires. EXTRA OFFER: You can order a bracelet to the specified measurements. FREE service! We also make orders for a set finished in sterling silver for an additional fee. Please contact us. A set consisting of a bracelet and earrings made of oval shape crystals with AB effect (Aurora Borealis). Extremely impressive and shiny jewelry !!! MATERIALS: Oval crystals with AB effect 6mm and 8mm. This set is finished with silver-plated elements. MEASUREMENTS: Length of the bracelet – 16,5cm plus 4cm of extender chain, Earrings – 4,5cm without earwires. EXTRA OFFER: You can order a bracelet to the specified measurements. FREE service! We also make orders for a set finished in sterling silver for an additional fee. Please contact us. 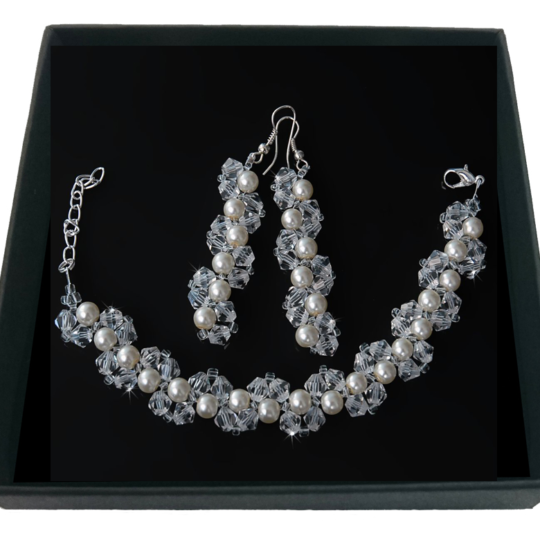 A set consisting of a necklace, bracelet and earrings made of diamond shape crystals. Extremely impressive and shiny jewelry !!! MATERIALS: Oval crystals with AB effect 6mm and 8mm. This set is finished with silver-plated elements. MEASUREMENTS: Necklace length: 45cm Bracelet length: 16,5cm plus 4cm of extender chain, Earrings – 4.5cm without earwires. EXTRA OFFER: You can order a bracelet to the specified measurements. FREE service! We also make orders for a set finished in sterling silver for an additional fee. Please contact us. Beautiful, eye-catching jewelry made using clear crystals and white pearls. High quality glass crystals have excellent cut quality and shine beautifully in the light. Extremely impressive and shiny jewelry!!! MATERIALS: Crystals (transparent) in a diamond shape and white glass pearls with a diameter 6mm. This set is finished with silver-plated elements. MEASUREMENTS: Width of the bracelet: 2,5cm. Length of the necklace – 42cm plus a chain to adjust 4cm, Length of the bracelet – 17cm plus a chain to adjust 4cm, Earrings – 7cm without earwires. EXTRA OFFER: You can order a bracelet and a necklace to the specified measurements. FREE service! The set is also available in ecru pearls. Beautiful, eye-catching jewelry made using clear crystals and white pearls. High quality glass crystals have excellent cut quality and shine beautifully in the light. Extremely impressive and shiny jewelry!!! MATERIALS: Crystals (transparent) in a diamond shape and white glass pearls with a diameter 6mm. This set is finished with sterling silver elements. MEASUREMENTS: Width of the bracelet: 2,5cm. Length of the necklace – 42cm plus a chain to adjust 4cm, Length of the bracelet – 17cm plus a chain to adjust 4cm, Earrings – 7cm without earwires. EXTRA OFFER: You can order a bracelet and a necklace to the specified measurements. FREE service! The set is also available in ecru pearls. 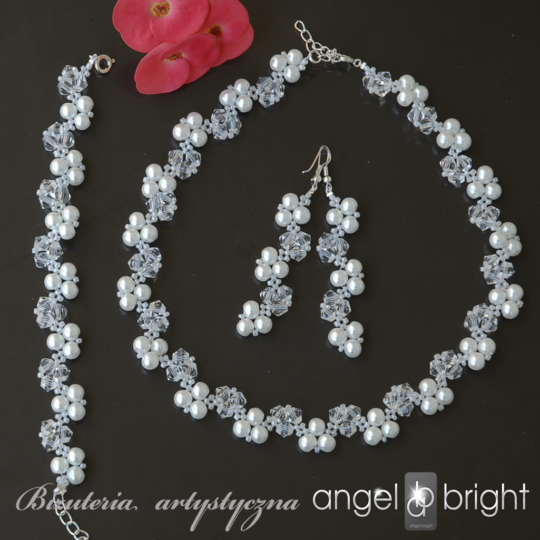 A set consisting of a necklace, a bracelet and earrings made of ecru glass pearls and zircons. Pearls are classic and timeless beauty! MATERIALS: Glass pearls in white with a diameter 8mm. 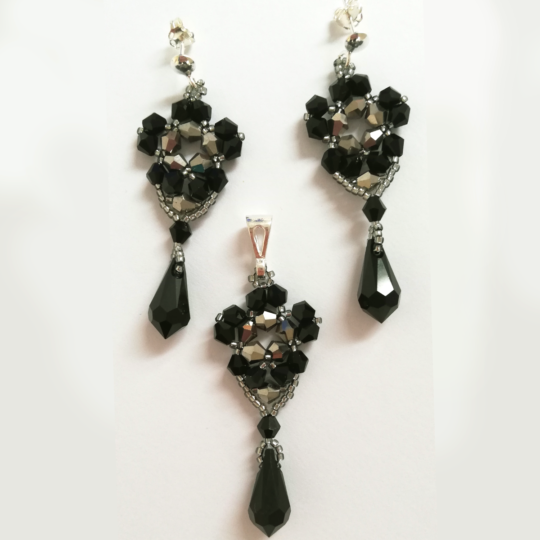 This set is finished with silver-plated elements. MEASUREMENTS: Length of the bracelet – 17cm plus a chain to adjust 4cm, Earrings – studs – a single bead studded with zircons of 8mm diam. Set on a silver studs. EXTRA OFFER: You can order a bracelet and necklace to the specified measurements. FREE service! 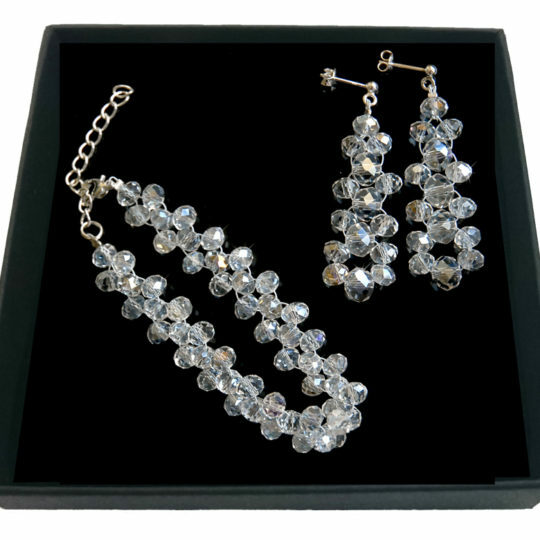 A set consisting of a bracelet and earrings made of diamond shape crystals. Extremely impressive and shiny jewelry !!! MATERIALS: Crystals in diamond shape: 6mm, 8mm and 10mm. This set is finished with sterling silver elements. MEASUREMENTS: Length of the bracelet – 16,5cm plus 4cm of extender chain, Bracelet width: 1,5cm Earrings – 7cm without earwires. EXTRA OFFER: You can order a bracelet to the specified measurements. FREE service! A set consisting of a necklace, bracelet and earrings made of diamond shape crystals. Extremely impressive and shiny jewelry !!! MATERIALS: Crystals in diamond shape: 6mm, 8mm and 10mm. This set is finished with silver plated elements. In another offer of our store, there is available set finished in sterling silver. MEASUREMENTS: Necklace length: 45cm Bracelet length: 16,5cm plus 4cm of extender chain, Bracelet width: 1,5cm Earrings – 7cm without earwires. EXTRA OFFER: You can order a bracelet to the specified measurements. FREE service! A set consisting of a necklace, bracelet and earrings made of diamond shape crystals. Extremely impressive and shiny jewelry !!! MATERIALS: Crystals in diamond shape: 6mm, 8mm and 10mm. This set is finished with sterling silver elements. MEASUREMENTS: Necklace length: 45cm Bracelet length: 16,5cm plus 4cm of extender chain, Bracelet width: 1,5cm Earrings – 7cm without earwires. EXTRA OFFER: You can order a bracelet to the specified measurements. FREE service!